I took the ferry over to Cat Ba town, on the south side of Cat Ba Island, and facing the beautiful Lan Ha Bay. 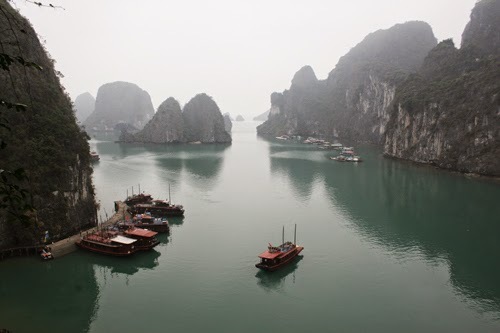 From here, you can go on boat trips out into the bay to visit the various islands and caves (some of which are illuminated for the tourists). You can kayak through bays of still, black water, flat as a mill-pond. 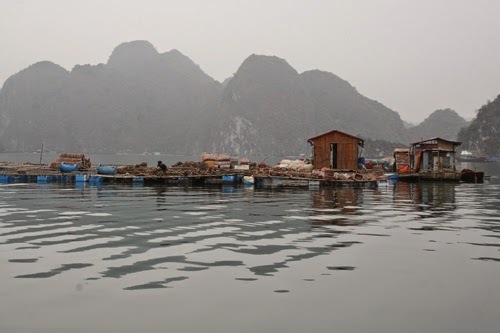 Or visit floating villages where the fish-farmers live. You can go rock-climbing up the karsts, trek in the national park, or swim and sunbathe on several nearby beaches.... unfortunately I visited in March. It was cold and foggy every single day, and drizzly a lot of the time as well. On the plus side, I had those beaches all to myself. I took my shoes off and wandered happily across the sand, looking at shells and enormous dead jellyfish washed up by the tide. The beaches, called Cat Co 1, 2 and 3, are connected by a series of cliff-top walks, although at the time I visited the path to Cat Co 2 had fallen into disrepair and was closed. I walked for miles along the cliff-tops and through the interior. I did do some kayaking, and I took a full day boat trip that explored 3 caves, 1 small island, and a floating farm. It was fun (although please be aware, safety standards are not amazing in this part of the world, and the boat I was on didn't appear to have any life jackets). A lot of tourists come to Cat Ba on organised overnight tours from Hanoi, but it's perfectly easy to get here under your own steam. 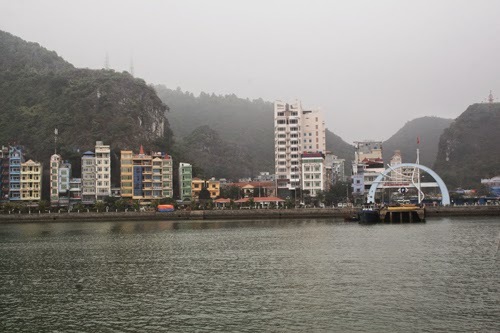 If you book a combined bus and ferry ticket from Hanoi, your bus will likely drop you off at a small travel agent's office on the outskirts of some town (Halong City? ), where a mini bus will take you to a small dock (Bai Chay?) from whence your speedboat will whisk you out to Cat Ba Island. If the speed boat doesn't dock right in Cat Ba town (in this instance it was Gia Luan Harbour, on the north side of the island) there will be another waiting bus to take you into town. It sounds a little complicated, and as no one spoke much English I wasn't ever really certain exactly where we were, but in reality it all went very smoothly. The hotels are really cheap in the off-season (I scored an enormous family room with a view over the bay for only £5 a night). Most of the hotels are very tall and skinny, and half of them lack lifts (so you might want to check if they offer you a room on the 7th floor). The restaurants in town are a bit mediocre, to be honest, but the stalls around the market do a decent bowl of pho, and you can buy plenty of fruit and snacks at the market (if you haggle, the prices are actually quite reasonable). The photos I brought home were less than brilliant, as the fog obscured some of those famous views. C'est la vie!